Doctor Rebecca Brown | Dr. Rebecca Brown | Rebecca Brown, M.D. 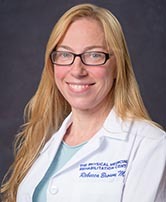 Dr. Rebecca Brown received her Medical degree from SUNY Downstate Campus in Brooklyn, and completed her residency in Physical Medicine and Rehabilitation at Mount Sinai School of Medicine in New York. Dr. Brown works in our practice at the Riverdale, Fort lee, and west New York offices while also providing rehabilitation care in the Jewish Home Lifecare's Manhattan Campus. Dr. Brown has an interest in the full scope of Physical Medicine and Rehabilitation services including outpatient musculoskeletal care, electrodiagnosis, prolotherapy and inpatient rehabilitation. Brown R and Kahn S. Discitis post Discography: A Retrospective Review. COSA#252-06.